SWANS have announced a remastered reissue of their ninth studio album, The Great Annihilator, out on April 28 on Young God Records / Mute (outside N America) plus further dates for their spring tour of Europe and the U.K. The Great Annihilator, originally released in 1995 and described at the time as “…a majestic symphony of haunting melodies and shifting moods” [SF Bay Guardian], will be released on double vinyl and as a 2xCD set. 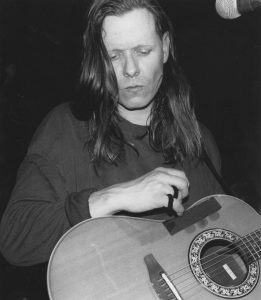 Both the vinyl (in the form of a download code) and CD will feature Drainland, Michael Gira’s debut solo album recorded at the same time as The Great Annihilator. The Great Annihilator line-up features: Michael Gira, Jarboe, Bill Rieflin, Algis Kizys, Norman Westberg, Clinton Steele and Ted Parsons. The Great Annihilator is the latest is a series of Swans remastered reissues. It was preceded by the first vinyl re-release of their debut long player Filth along with a deluxe 3xCD version of Filth including the original album, Swans’ debut EP, the Body To Body collection and a generous selection of vintage live recordings. This was followed by White Light from the Mouth of Infinity/Love of Life: the two albums came as a limited vinyl box set, presented in the original restored artwork. The 2500-micron black lined box – with original logo in silver foil block in black paper – also including two rare posters, a CD of outtakes, rarities, and contemporaneous live recordings and a download code for both albums. White Light from the Mouth of Infinity / Love of Life was also released as a 3xCD set (including the bonus disc). Both are available digitally and as vinyl releases separate from the limited box set.